The Mouse IgG Type and Titer assay is a patented novel assay platform for mouse antibody discovery that saves you precious time by combining three separate assays into a single multiplex, high throughput assay. Speed: Sample to actionable data workflow time—assay set up, incubation, read—under 100 minutes per 384 well plate. Real time analysis and visualization from one powerful software package: ForeCyt. Results: Five endpoints from a single multiplexed, no-wash/no-dilution assay: IgG isotype identification, IgG quantity per isotype, total IgG secretion level, cell viability, and cell counts. Simplicity: Single Platform Assay Development and Data Acquisition eliminates the time and confusion of acquiring, analyzing and correlating data from multiple assays on multiple platforms. Precision: Isotyping facilitates specific primer design for superior PCR-mediated gene cloning. Cell quality criteria determine the best clones for RNA isolation. Let us show you how to expedite your antibody discovery campaign and increase your competitive advantage. Intellicyt has developed a novel solution to disrupt the traditional antibody discovery workflow. Success of antibody-based block-buster therapeutics for autoimmune diseases, inflammatory diseases and immune-oncology have accelerated high stakes monoclonal antibody (mAb) discovery—a time-consuming process in which therapeutic antibody candidates are initially generated using hybridoma technology or primary B cell screening after antigen immunization. The primary screens identify clones with specific attributes (binding specificity, cross species reactivity, selectivity and affinity). Potential candidates from the screen are then assessed for a variety of critical parameters for lead molecule generation such as IgG isotyping, antibody quantification, and cell number/health. This process typically involves single-endpoint assays requiring sample dilution and multiple washes. The Mouse IgG Type and Titer assay is part of Intellicyt’s integrated antibody discovery platform technology. 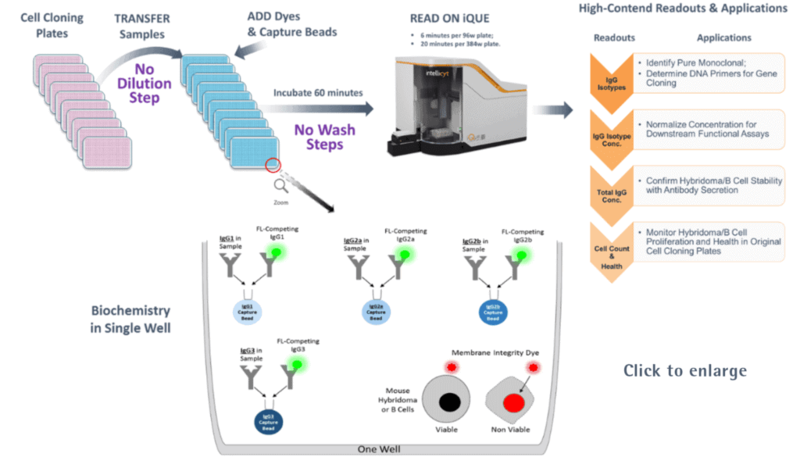 The iQue Screener PLUS can acquire data in as little as 20 minutes per 384-well plate, while ForeCyt software provides powerful data mining tools for large hybridoma/B-cell screening studies. ForeCyt’s Panorama feature provides interactive and visual multi-plate data analysis including profile maps with user-specified criteria to quickly identify samples containing the desired IgG isotype, antibody concentration and cell health, critical for analyzing data from large, multi-plate screening campaigns. The total time from samples to actionable data is less than 100 minutes. Streamlined workflow means experiment set-up and data acquisition for this multiplex assay takes about 100 minutes—and that includes incubation! Mouse IgG Type and Titer Workflow. Samples from hybridoma or B-cell cloning plates are directly transferred to the assay plate without an intermediate dilution step. Each assay well is seeded with four different types of capture beads, each with a specific affinity for a single IgG isotype. The IgG isotype in the sample will compete with the same FITC-labeled IgG isotype to bind to the capture bead. The IgG isotype quantity will be calculated from the isotype-specific standard curve. If cells are included in the assay well, a membrane integrity dye in the detection reagent will stain the membrane-compromised dead cells by DNA intercalation. After the addition of the detection reagent mixture and the capture beads to the samples and 60 minute incubation, the samples are acquired on the iQue Screener PLUS.